Courtesy of ADDVANTAGE Real Est. Services. Prestigious Bermuda Riviera neighborhood, A rated Bayview Elementary school district. Walk to beach, grocery, pharmacy and restaurants, 80 ft on deep water wide canal, no fixed bridges. Home, street and dock stay dry in high tides. Stroll along the shaded neighborhood linear park. Deeded beach access. 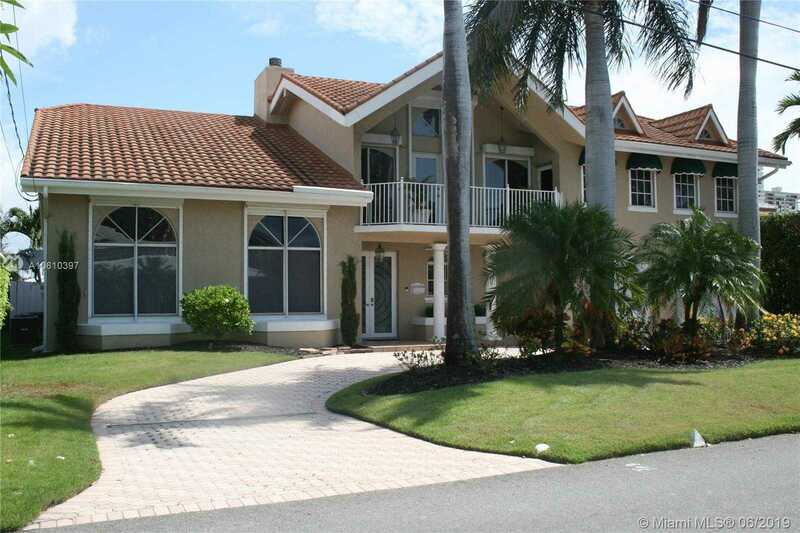 4300 Total Sq Ft, 3800 under AC, 4 bedroom, 4 1/2 bath, waterfront pool home.. Vaulted ceilings in master and 2 upper bedrooms. 2-story open to ceiling in foyer and dining area. Custom cabinets. Utility room. Dual staircases. Spacious loft area, possible 5th bedroom. 2 attics. 4-zone newer ACs. Wood-burning fireplace. Steam shower in master bath. Stone coated steel barrel tile roof installed 2006. 27,000 lb cradle boat lift. Sunrise Middle and Fort Lauderdale High district.